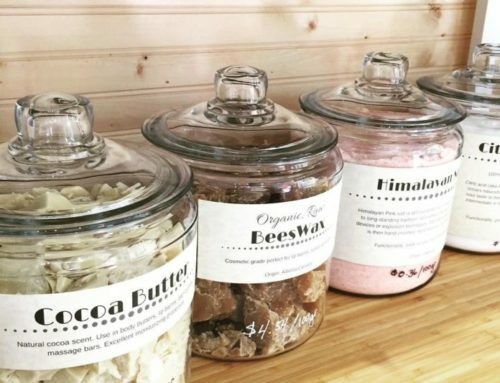 Zero waste bulk or refill stores are still quite small in number, but the movement is gaining momentum! 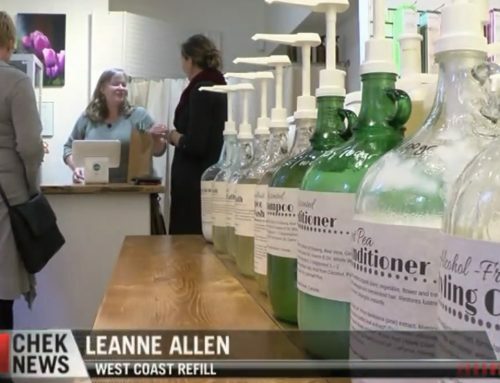 West Coast Refill is one of the wonderful pioneers! It is a small refill store almost hidden in Downtown Victoria’s “Dragon Alley” (yes, I KNOW! So Harry Potter 🧙‍♀️✨ LOL!). West Coast Refill offers basic household and body cleaning products. Owner Leanne makes an effort to not only keep everything eco but also wallet friendly and accessible to anyone who wants to reduce their waste or just have a healthier lifestyle. Leanne is such an inspiring person! We had the best time chatting about zero waste and I really wish we could have stayed longer!! Leanne used to manage a Starbucks. That Starbucks must have been the world’s most eco-conscious Starbucks location, because Leanne refused to accept the huge amounts of trash created by to-go cups! She made it a store policy to make sure to ask every customer if they wanted their beverage “to go” or “for here”, and every “for here” beverage was to be served in reusable, real mugs and cups. She tried to reduce the trash to her best abilities within the corporate framework, and she did a phenomenal job! But needless to say, Starbucks might not be the most fulfilling work environment for a zero waste enthusiast. 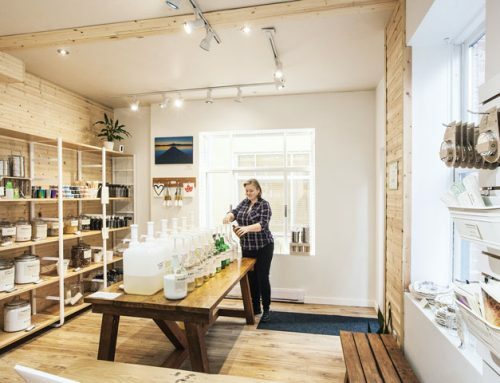 So Leanne took the leap and opened her own small zero waste refill store to divert even more waste from landfills! So How Exactly Does It Work Me Bringing My Own Containers? It’s very straight forward, really. 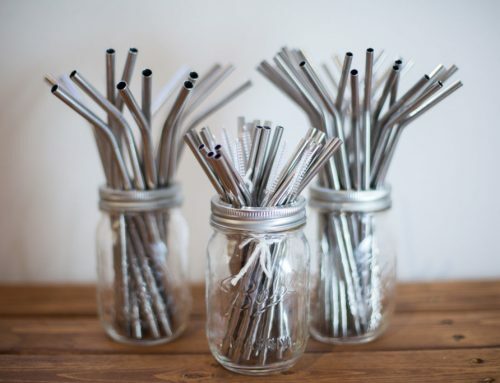 You bring your own, clean bottles, jars, or containers, tare them on the scale, and you are all set to fill them up with whatever (locally sourced) goodness you choose! You can choose a bottle and combine it with a spray or pump attachment! If you don’t have the right bottle, jar, or container at home, you can also choose one from their (very darn cool) selection! West Coast Refill does not offer food items, but you can buy cloth bags for your next visit to the bulk aisle, e.g. at Bulk Barn just a stone throw away. 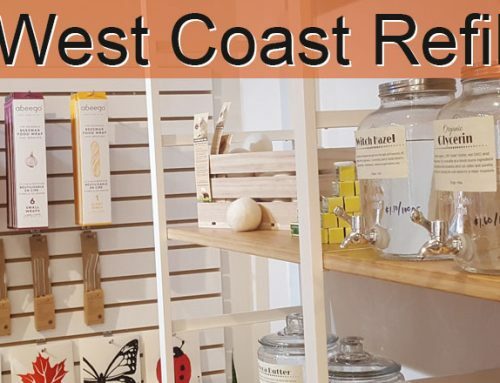 West Coast Refill focuses on what is difficult to get: zero waste helpers and basic and affordable household and body cleaning products instead of premium soaps. They offer a good selection of body cleaning products like body wash, bubble bath, shampoo, and conditioner. What’s super cool—in my humble opinion—is the hair spray!! West Coast Refill offers all basic DIY ingredients that a zero waster would want to make their own cleaning products or cosmetics. But of course you can also buy ready-to-go cleaning products! We were very happy to see Brush with Bamboo toothbrushes! We have been gifting bamboo toothbrushes ever since we embarked on our zero waste journey and bought two of these beauties, because, well, let’s say I really went down the rabbit whole on my quest to find the most sustainable toothbrush, and for us living on the Canadian West Coast Brush with Bamboo ist the most eco-friendly option, and a company we trust. We have been either making our own toothpaste or just using baking soda to brush our teeth. I am happy to see that there are more and more all-natural toothpaste options sold in jars. More than once had I almost given in to the itch of buying a jar. I might one day, if I find a brand without those plastic seals. Personally, I love the flowers! They are useful for home remedies or just to make your home smell nice. You can buy natural sponges or loofahs to clean your body. The brush on the right in the picture is actually a all-natural brush to clean pots and pans. And who needs a sponge to do the dishes? We certainly don’t! We use cotton rags that aren’t as nice or beautiful as these crochet ones! If you feel you can’t do without a spongy thing in your hand when doing the dishes, West Coast Refill also has these Swedish compostable cloth sponge hybrids. … like a plastic-free, all stainless steel ice cube tray! 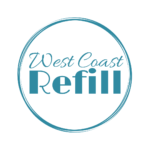 If you live in Victoria or visit Vancouver Island, do make sure to pay West Coast Refill a visit ❤! Leanne is one heck of an inspirational and down-to-earth lady ✨, and I love how she chose her selection so carefully so it is affordable for anyone who wants to go zero waste!